Dudak damak yarıkları yüz yapılarında en sık görülen konjenital anomalidir. Ülkemizde 1/800 oranında görülmektedir. Bu anomaliye sahip bireylere ameliyat öncesi ortopedik uygulamalar yaygın biçimde yapılmaktadır. Bu olgu sunumunun amacı, 3 boyutlu görüntüleme tekniği kullanılarak ameliyat öncesi nazoalveolar şekillendirme ve ameliyat sonrasında elde edilen değişiklikler açısından bilateral dudak damak yarıklı bir bebeğin tedavi sonuçlarını değerlendirmektir. Cleft lip and palate is the most common congenital anomaly in facial structures. In our country, this anomaly was encountered 1/800 ratio. Pre-operative orthopedic therapy is widely applied to the individuals with cleft lip and palate. The aim of this case report is to evaluate the treatment results of an infant with bilateral cleft lip and palate in terms of changes obtained after pre-operative nasoalveolar molding and surgery using three-dimensional imaging technique. Derijcke A, Eerens A, Carels C. The incidence of oral clefts: a review. Br J Oral Maxillofac Surg 1996;34:488-494. Borçbakan C. Dudak Damak Yarıkları, Hacettepe Taş Kitapçılık, Ankara 1980. Mossey PA, Little J, Munger RG, Dixon MJ, Shaw WC. Cleft lip and palate. The Lancet 2009;374:1773-1785. Doruk C, Öztürk F, Özdemir H, Nalçaci R. Oral and nasal malodor in patients with and without cleft lip and palate who had undergone orthodontic therapy. Cleft Palate Craniofac J 2008;45:481-484. Sokucu O, Nalcaci R, Ozturk F, Toy S. Dudak damak yarıklı bireylerin kendini-kabul düzeylerinin değerlendirilmesi. 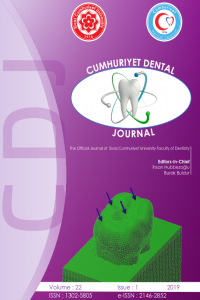 Cumhuriyet Dental Journal 2011;11:35-39. Kocadereli İ, Aksu M. Dudak Damak Yarıklarında Ortodontik Yaklaşım: Dudak Damak Yarıklarında Ortognatik Cerrahi Öncesi Hazırlık. Turkiye Klinikleri J Plast Surg-Special Topics 2011;3:111-7. Demirkaya A. Dudak Damak Yarıklarında Ortodontik Yaklaşım: Yenidoğan ve Karışık Dişlenme Dönemleri. Turkiye Klinikleri J Plast Surg-Special Topics 2011;3:50-5. Grayson BH, Santiago PE, Brecht LE, Cutting CB. Presurgical nasoalveolar molding in infants with cleft lip and palate. Cleft Palate Craniofac J 1999;36:486-498. Grayson BH, Shetye PR. Presurgical nasoalveolar moulding treatment in cleft lip and palate patients. Indian J Plast Surg 2009;42 Suppl:S56-61. Dogan S, Semb G, Erbay E, Alcan T, Uzel A, Kocadereli I et al. Dental arch relationships in Turkish patients with complete unilateral cleft lip and palate born between 1976 and 1990: a comparison with eurocleft. Cleft Palate Craniofac J 2012; In-Press; doi: http://dx.doi.org/10.1597/11-304R1. Ghoddousi H, Edler R, Haers P, Wertheim D, Greenhill D. Comparison of three methods of facial measurement. Int J Oral Maxillofac Surg 2007;36:250-258. Pai BC-J, Ko EW-C, Huang C-S, Liou EJ-W. Symmetry of the nose after presurgical nasoalveolar molding in infants with unilateral cleft lip and palate: a preliminary study. Cleft Palate Craniofac J 2005;42:658-663. Kusnoto B, Evans CA. Reliability of a 3D surface laser scanner for orthodontic applications. Am J Orthod Dentofacial Orthop 2002;122:342-348. Fisher DM, Lo L-J, Chen Y-R, Noordhoff MS. Three-dimensional computed tomographic analysis of the primary nasal deformity in 3-month-old infants with complete unilateral cleft lip and palate. Plast Reconstr Surg 1999;103:1826-1834. Kau CH, Richmond S, Incrapera A, English J, Xia JJ. Three-dimensional surface acquisition systems for the study of facial morphology and their application to maxillofacial surgery. Int J Med Robot 2007;3:97-110. Millard DR, Cassisi A, Wheeler JJ. Designs for correction and camouflage of bilateral clefts of the lip and palate. Plast Reconstr Surg 2000;105:1609-1623. Farkas L. Anthropometric of the Head and Face. New York, NY: Raven Press, 1994. Suri S. Design features and simple methods of incorporating nasal stents in presurgical nasoalveolar molding appliances. J Craniofac Surg 2009;20 Suppl 2:1889-1894. Huddart AG, MacCauley FJ, Davis ME. Maxillary arch dimensions in normal and unilateral cleft palate subjects. Cleft Palate J 1969;6:471-487. Stockli PW. Application of a quantitative method for arch form evaluation in complete unilateral cleft lip and palate. Cleft Palate J 1971;8:322-341. Maull DJ, Grayson BH, Cutting CB, Brecht LL, Bookstein FL, Khorrambadi D et al. Long-term effects of nasoalveolar molding on three-dimensional nasal shape in unilateral clefts. Cleft Palate Craniofac J 1999;36:391-397. Weinberg SM, Scott NM, Neiswanger K, Brandon CA, Marazita ML. Digital three-dimensional photogrammetry: evaluation of anthropometric precision and accuracy using a Genex 3D camera system. Cleft Palate Craniofac J 2004;41:507-518. Grayson BH, Cutting CB. Presurgical nasoalveolar orthopedic molding in primary correction of the nose, lip, and alveolus of infants born with unilateral and bilateral clefts. Cleft Palate Craniofac J 2001;38:193-198. Hardingham T, Muir H. The specific interaction of hyaluronic acid with cartilage proteoglycans. Biochimica et Biophysica Acta (BBA)-General Subjects 1972;279:401-405.